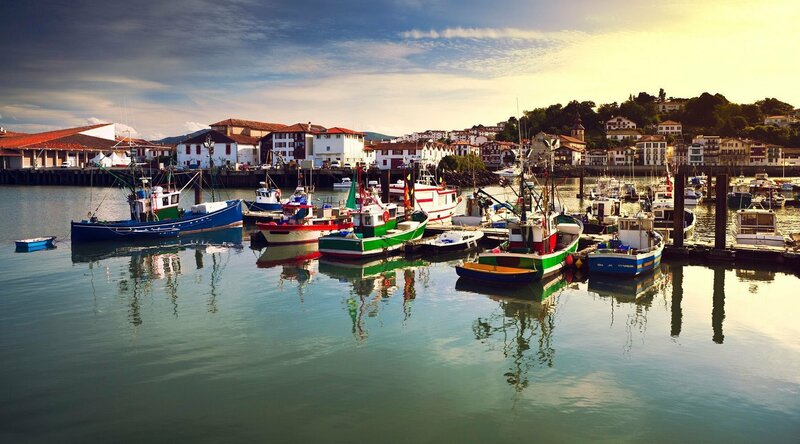 One of France’s most picturesque beach retreats, St. Jean de Luz is a prosperous Basque town best known for its architecture and cuisine. A prosperous fishing port, it grew rich in the 16th century from fishing and whaling, supplemented by piracy that was backed by the French king. In fact many of the handsome old houses in town were built on the proceeds. In the magnificent Church of St John the Baptist, with its fabulous baroque altar, the Sun King, Louis XIV King of France, married Marie-Therese of Spain in 1660. This beautiful sandy beach is located in the very center of St. Jean de Luz. Sea walls at the mouth of the bay keep the water calm, while the wonderfully sandy beaches invites relaxation. Built in the Basque style, the church dates back to the 1600s. It is here that King Louis XIV of France married Maria Teresa, the Spanish infanta. The church has a working pipe organ from the 1700s and the main sanctuary is said to have extraordinary acoustics. Discover Biarritz on this walking tour, following in the royal and imperial footsteps. Biarritz came to fame when Empress Eugenie (wife of Napoleon III) fell in love with Basque country and built a Palace on the beach (which is now the World Class Hotel du Palais). Set off through the historically charming streets of San Sebastian on a delicious evening walk that leads to the city’s favorite tapas bars. Authentically experience Saint Jean de Luz by embarking on this thorough, fascinating, and gorgeous guided walking tour. Explore Biarritz from a local's perspective on this spectacular guided walking tour that will open your eyes to the town's history, architecture, and incredible scenery.